When we went to a shrine, we saw a wedding which was Japanese style. A bride wore a traditional wedding Kimono. Our wedding was not Japanese style. I regret I should have worn Kimono. Sometimes I am getting angry over nothing. Because I live in now. And it is very busy on business. And I am not god. Yesterday I had a big headache and stiffness in my shoulders. I think I try to go the acupuncture this week. I think blog is very nice for me. But it is difficult to post my feeling. I have a little stress to post. We went to Miami beach. Noway! I realized our country has a lot of beautiful places. This is Enoshima, which is a little island , is in Kanagawa prefecture. We just can walk to Enoshima on bridge. SzélsőFa asked me "onions in the bathtub? for what reason? decoration? " Now I answer this is not onions. That is Sweet Flag. When it is May 5 , we take a bath with Sweer Flag. May 5 is Children's Day (boys day). We celebrate their happiness. So we take a bath with Sweer flag, they become to be health more. 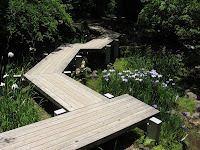 When we went to Shikoku, I took this picture. When it is May 5, parents who have boys decorate carp-shaped flags. These are Japanese iris. My uncre, who lives in Nara, sent pictures. 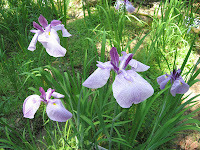 I misunderstood sweet flag and iris are same plants. My uncle adviced plants in the bath is defferent of iris by e-mail. I think SzélsőFa's bathtub is deffernt of our bathtub. And it is defferent of bathing Japanese style. I found a good derection of blog how to take a bath in Japan. When bathing Japanese style, you are supposed to first rinse your body outside the bath tub with some water from the tub, using a washbowl. Afterwards, you enter the tub, which is used for soaking only. The bath water tends to be relatively hot for Western bathing standards. If you can barely enter, try not to move much, since moving around makes the water appear even hotter. After soaking for a while, leave the tub and clean your body with soap. Make sure that no soap gets into the bathing water. Once you finished cleaning yourself and rinsed all the soap off your body, enter the bath tub once more for some more soaking. After leaving the tub, do not drain the water, since all household members will use the same water. I don't want to wash my body in a bath tub. When I try to wash my body in a bath tub at a western style hotel, I can't soak in the buthtub again. Because water is dirty. I don't know western familly's bathroom. I just see movies. When I watched movies with my mother , why their bath tub had a lot of bubbles? After they took a bath, how they do it? Which do you like showing or soaking in the bathroom? When you take a bath, you use shower. I think your culture is shower culture. Therefore you say “He showered me with flowers.” “Bridal shower”. I think shower can’t continue. Someday it might be stopped. The other hand, when we take a bath, we soak in the bathtub, and we wash our bodies out of bathtub. I don’t wash my body in a bathtub. Before we take a bath, it is supposed to pool hot water in bathtub. I love bathing. If I go to trip, I stay a hotel which is western type. I think I can’t be relaxed. I want to soak in love like hot spring, which will not stop. This photo is the shop of Perth station in Australia. When we went to Perth, I took it five years ago. My older son likes this train of photo. I heard my friends went to Perth in Australia three months ago, they could watch this train. I took a picture in the ship which was the other ship of Part3 ship. When we went Naruto, it was not a big tide's day. If it was a tide's day, the whirpool's might be bigger than this day. I'm not sure you say it "whirlppl". Soryy, this voice was me. This video is only Japanese. But this time he could sleep the top bunk in the ship. He was very happy. This is a big bath in the ship. I took a bath waching sea.